European institutions are helping Ukraine extend its already outdated nuclear operations — increasing short-term risks and halting energy alternatives for the future. 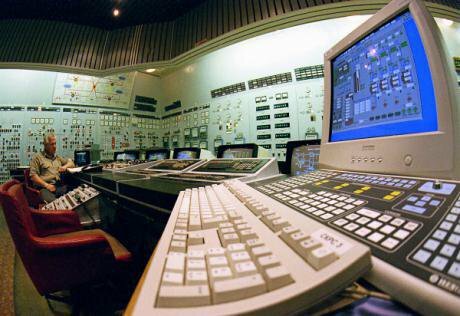 The control room at Zaporizhzhia Nuclear Power Plant. (c) VisualRIAN. All rights reserved.In the past few weeks, two of Ukraine’s Soviet-era nuclear reactors received a lease on life for an additional 10 years beyond their originally projected life-span. Units 1 and 2 at the Zaporizhska nuclear power plant, Europe's largest, are the fifth and sixth units to have their expiry dates extended by Ukraine’s nuclear regulator. This is a dangerous move, which violates international law and democratic principles. Nuclear proponents, Ukrainian governmental officials and the state nuclear power operator Energoatom argue these extensions are necessary. But is it really? And who benefits from the continued operation of Ukraine's aging nuclear fleet? European financial institutions play an important role in this game. Contributions to Ukraine's nuclear program (totaling 600m euros) enable the operation of old nuclear power plants to continue. On the face of it, the “nuclear safety upgrade program”, supported by Euratom and the Bank for Reconstruction and Development (EBRD), is meant to help Ukraine improve safety standards in its nuclear units. But in reality, the EU is paying (60% of EBRD shares belong to EU member states and the European Investment Bank) and Ukraine is extending operation of its unsafe, aging reactors beyond their original lifespan without completing some of the top priority safety measures. Currently, 55% of Ukraine's electricity comes from nuclear power, with the remaining mostly from gas and coal. The country faces numerous economic and geopolitical challenges, given the ongoing armed conflict in the east of the country. In fact, the Zaporizhska nuclear power plant is 250km from the frontlines. It is obvious that the nuclear reactors can not be simply switched off from one day to another. Instead, what is needed is a principal change of direction in Ukraine’s energy sector towards a sustainable, safe and climate friendly future. Sadly, the foresight and will for this key step for Ukraine’s future is lacking among the country’s elites. Rather than recognising the need to transform Ukraine's energy sector, the government prefers to cling to the old energy generation fleet as long as it can. To a large degree, this trend is the result of the influence of the strong pro-nuclear lobby, led by Energoatom for whom the country's 15 reactors are its main asset. In the past, EU investments in the Ukraine’s energy sector were predominantly geared toward supporting the country’s nuclear sector and its transmission lines, with only 15% of funds going to energy efficiency and renewables. In the country with such a massive potential for both, this fact is not only regrettable, but irresponsible. The EU money that enables the continued operation of Ukraine’s old reactors comes with strings attached. Loan agreements signed between Energoatom and Euratom and the EBRD stipulate that Ukraine must adhere to the UN Espoo and Aarhus Conventions, which mandate public participation in projects that can have negative environmental impacts, including transboundary impacts. However, Kiev has so far ignored its obligations under these conventions. In its official communications with the governments of neighbouring states, Ukraine’s environmental ministry insists that nuclear lifetime extensions do not require international public consultations. This attitude is worth noting since Ukraine has already been found in breach of the Espoo Convention. The authorities did not conduct transboundary consultations when they authorised the lifetime extensions of two reactors at the Rivne power plant in western Ukraine in 2010. Ukraine passed very similar decisions extending four other reactors since and again without consulting its neighbors, even when the governments of Slovakia, Romania, Austria, Germany and Hungary claim their right to be involved. And European public funders, Euroatom and EBRD, have been turning a blind eye on violations of loan agreements and international law. On the domestic front, opposition to nuclear decision-making is silenced. Our colleagues in Ukraine, who have been voicing safety concerns, were sued in 2015 by Energoatom, Ukraine’s nuclear operator, and the state nuclear regulator joined in later. Eventually, the court backed the plaintiffs, who argued the public critique of the nuclear revival programme was inappropriate. Meanwhile, EU institutions keep on paying to support Ukraine’s aging nuclear fleet and claim to support democracy and rule of law in the country. The European Union is therefore complicit in the direction Ukraine's energy sector is taking. Whatever the interests behind the lifetime extensions of old nuclear units in Ukraine, it must not endanger citizens in Ukraine or neighbouring countries. Our rights to sustainable and safe energy, and to be involved in decision-making, have been blatantly overlooked. When Europe tolerates the violation of international conventions, it sends Ukraine the wrong message on democracy and the rule of law. When Europe helps Ukraine extend its nuclear agony for up to 20 more years, the state has few incentives to start exploring energy alternatives. And when European public money supports this kind of nuclear development, it sets a dangerous precedent throughout Europe, where no less than 30 reactors are about to reach the end of their design lifetime. The European public should follow where our money is going. The European Commission is expected to introduce the legislative and financial framework for the electricity market soon — we need to make sure it is paving the way for our safe and progressive future.